Activision's Call of Duty franchise has passed the $3 billion sales mark. 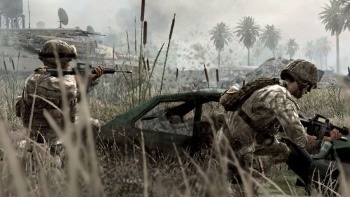 Acitivision has announced that the Call of Duty franchise has passed three billion dollars in global sales following the release of Modern Warfare 2 and it's estimated $550 million in sales in its first week. Acitivision also said that the franchise had sold over 55 million units since its creation in 2003. "If you consider the number of hours our audiences are engaged in playing 'Call of Duty' games, it is likely to be one of the most viewed of all entertainment experiences in modern history," said Acitivision boss Bobby Kotick. With Activision rumored to be adding a third studio to the development team, it seems that the juggernaut that is Call of Duty is in little danger of slowing down.